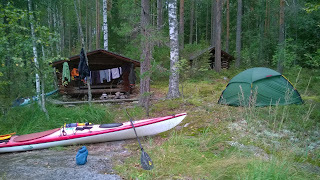 Because the previous day was a short one, only half a day, we had to paddle one longer day i.e. 60 km distance. The wind was quite strong 6-7 m/s but it was blowing mostly from north-west or north. Therefore we didn't had headwind, but still it was quite demanding to paddle on large open water areas, where waves were higher. We had a long first stretch to Savonranta guest harbor, where we had a long and rewarding break at local cafeteria / restaurant. The first pizza during this paddling tasted heavenly. The paddling route of the sixth day can be seen here.